The Kilpatrick Renaissance recently won an Excellence in Masonry award from the Masonry Advisory Council. Worn Jerabek Wiltse Architects, P.C. is proud to have been a team member on this project. Congratulations to everyone involved! The Kilpatrick Renaissance is a 4-story independent senior’s apartment building located in Chicago’s Portage Park neighborhood. The project was built to address the need for affordable housing options that would allow local seniors to remain in the neighborhood they call home. 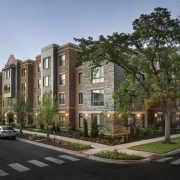 It includes 98 residential units available to seniors ages 55+ that consist of 38 studio apartments, 54 one bedroom apartments, and 6 two bedroom apartments. In addition to the residential units, The Kilpatrick Renaissance features numerous common amenities available to the residents including an on-site management office; club room with a fireplace, lounge areas, and a kitchen; sun room opening onto a beautifully landscaped private courtyard with a pergola, fire pit, and seating areas; library with computer stations; fitness room; resident storage units; and a 4th floor roof terrace with a pergola and lounge. In addition, the project includes a public pocket park on-site with seating areas, landscaped planting beds, and community garden plots that are open to all members of the community. The building’s exterior facade consists primarily of brick and stone masonry with detail elements of composite metal panels at the projecting bays. The massing of the 4-story building was broken up into smaller volumes to fit better within the neighborhood context. The project has incorporated a number of sustainable design features including energy efficient variable refrigerant flow mechanical systems for heating and cooling, energy recovery on the building’s ventilation system, high efficiency lighting, water-conserving plumbing fixtures, Energy Star appliances, and a rainwater harvesting system that will supply water for the landscaping irrigation system. The Masonry Advisory Council is a collaboration of Educators, Experienced Professionals, Engineers, and Supplier Groups that support masonry construction, materials and assemblies. Contact us with your masonry questions, we are here to help!